I have posted on ‘Holi” and google doodle marking the occasion… on “Holi’day ~ the train was near empty and IT corridor also seemed much less of traffic……….for those outside, Old Mahabalipuram Road(OMR) or IT Corridor is a major road in suburban Chennai, India, beginning at the Madhya Kailash temple in Adyar in South Chennai and continuing south till the famous Mahabalipuram … the ambitious corridor planned to take care of traffic a decade ago now brims with vehicles of all sorts. The pace of development along the road has been so rapid, that it is likened to ‘tsunami of buildings and cars’ – still there are many buildings remaining unoccupied and the common man shudders to think what will happen if all those building are to house offices and commercial establishments. In its first attempt to decongest the busy road and ensure trafficflow is smooth,the corporation has put the process of land acquisition on the fast track, and the second phase, for road widening between Siruseri and Mamallapuram, is now in its final stages. Officials of TNRDC say they will, if the Election Commission permits, float a tender now for a detailed project report on the feasibility of an elevated expressway from Taramani to Mamallapuram. 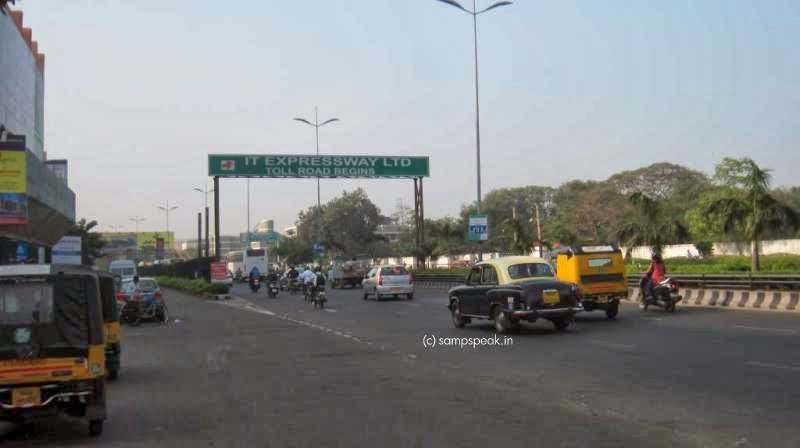 The project announced by CM Ms J Jayalalithaa – the elevated expressway could bring much needed relief. An underground metro has been ruled out, stating that the road is too close to the sea ! ~ a bus rapid transit system (BRTS) on the road to Mamallapuram is thought of as a probability. OMR is in news for wrong reasons too…. the recent brutal murder of an IT employee shook the city. There are other crimes too… recently, a notorious thief, known for stealing cables from mobile phone towers, was nabbed by a group of residents in Semmencherry. Here is something that those travelling in OMR should read and not be conned by a similar occurrence…..
TOI reports of a youth and minor girlfriend who stole phones from commuters were nabbed…………………………….. Luck ran out for the youth and his minor girlfriend who stole several mobile phones from commuters at bus stops after borrowing phones for ‘urgent calls’. While Asif Ahmed, a class 9 drop-out from Indira Nagar in Adyar, was arrested on Friday, Anitha (name changed) was nabbed on Saturday. She was let off after a stern warning. Eight smartphones worth more than 1 lakh and a bike wereseized. Police said Asif Ahmed and Anitha, smartly dressed, would cruise around busstops along the IT Corridor (OMR) looking for targets, mostly women. Anitha would approach the women saying her phone battery was down and she had to call her parents. After ‘getting’ the phone she would walk to where Asif would be waiting and they would speed away. The two would then sell the phones and head off for a resort on ECR where they would live it up. On Thursday night, they targeted a working woman professional, Deepika near Sholinganallur when she was waiting for a bus, police said. The woman immediately informed the control room, following which a special team, which was on patrol in the area, nabbed them; it was revealed that a similar case was registered against the duo at the Kotturpuram police station in February. The two, police found, had stolen several phones from unsuspecting commuters in Adyar, Thiruvanmiyur, Velachery, Pallikaranai and several parts of OMR. Miles away, Daily Mail reports that a mobile phone thief was jailed for 4 years …………. Yes as a "deterrent" sentence for robbing a 16-year-old boy in the street and punching him in the face. Judge Valerie Pearlman told Dean Healey, 23, that she regarded the street robbery as so serious to warrant an immediate custodial sentence. "The sentence I pass is to keep the public protected from you and as a deterrent to show that this type of offence will not be tolerated. "This is, as the courts repeat, a very prevalent offence, in this case aggravated by the fact there were two of you." At UK, Mobile phone muggers will in future face minimum jail terms of 18 months and those using violence, five years or more. The punch on the face and grappling of phone was regarded as a bad case of gratuitous street violence on a younger man. In UK, the message was clear that muggers are going to be punished severely and custodial sentences will be the only option available to the courts, unless there are very exceptional circumstances ~ and that it would apply irrespective of the age of the offender and irrespective of whether the offender has previous convictions……….. certainly tough laws are needed ! !